Is snap through shock the same as break through shock? How does reverse load affect press performance? What are the signs of negative tonnage problems? How do hydraulic shock dampers reduce press fatigue? What does external pressure adjustment really mean? Does W-Technologies offer tech support? Do shock dampers have to be customized for each tool? What is the tonnage range for W-Tech's Hydraulic Shock Dampers? Can dampers reduce maintenance costs for my application? Snap through shock and break through shock are both terms used to describe the instantaneous release of force when energy builds within a press, surpassing the material shearing strength and causing material fracture. A common occurrence in presses, snap through shock can be especially problematic with higher speed machines used for blanking. A wide range of problems can be caused by snap through shock, from damage to the press components to prolonged physical stress on press operators. Hydraulic shock dampers effectively control snap through shock and assure even loading of the press structure, which significantly improves component life. Negative tonnage problems usually manifest over time, becoming apparent in a variety of symptoms. Failure of slide connection area press components and other frame parts, as well as the premature wear of dies and punches can be indicative of negative tonnage issues. Loose or leaking air and hydraulic lines, electrical problems, and foundation issues are other signs. Excessively high noise level may also be a warning that negative tonnage is a problem. Hydraulic shock dampers effectively reduce negative tonnage to eliminate these issues before they arise. Without adequate control, snap through shock issues cause press fatigue by imposing compounding reverse load pressure on the press structure. Press fatigue cracks occur in the drive linkage, slide, crown, bed and housings. The most vulnerable parts, such as hydraulic lines and bolts, are affected first, and damage continues in a progressive manner. Even the most durably built presses are susceptible to press fatigue from negative tonnage issues. Hydraulic shock dampers absorb the forces generated during press operation so that the press structures are no longer subject to the affects. The installation process for W-Technologies shock dampers is as easy as setting up tooling inside a press. With an order from W-Technologies you will receive a manual on installation and you will receive support from our representatives if difficulties arise. We can also help you install the device if you would like us too. Remember that W-Technologies' staff is always here to help. Simply put, it turns our shock absorbers into a versatile product. You can adjust the tonnage capacity of each cylinder externally with ease. This makes our products quickly fit any new tonnage requirements on existing or different presses. Does W-Technologies offer technical support? Yes we do! We would be more than happy to assist you with our products long after purchase. Don't hesitate to call on us when you are in need. Yes and no. 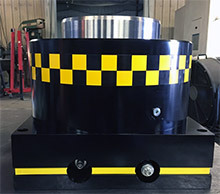 W-Technologies' custom shock dampers are built for the particular tool they were ordered for but, with external pressure control and a versatile design they are not limited to only one tool. However these shock dampers will be limited to a recommended tonnage range. The tonnage range for our dampers can fit anywhere between 12 to 600 tons. From what we have seen, yes it can! An informal survey of users that were experiencing press failures before installing W-Tech dampers have seen down time reduced as much as 75%.